Astronaut Biography: Brent W. Jett, Jr.
NASA astronaut and veteran shuttle commander Brent Jett poses for a portrait. PERSONAL DATA: Born October 5, 1958, in Pontiac,Michigan, but considers Ft. Lauderdale, Florida, to be his hometown. Married toJanet Leigh Lyon of Patuxent River, Maryland. EDUCATION: Graduated from Northeast HighSchool, Oakland Park, Florida, in 1976; received a bachelor of science degreein aerospace engineering from the U.S. Naval Academy in 1981; a master ofscience degree in aeronautical engineering from the U.S. Naval PostgraduateSchool in 1989. ORGANIZATIONS: Society of Experimental Test Pilots,Association of Naval Aviation, U.S. Naval Academy Alumni Association,Association of Space Explorers. SPECIAL HONORS: Graduated first of 976 in the Classof 1981 at U.S. Naval Academy; Distinguished Graduate U.S. Naval Test PilotSchool Class 95. Awarded the Distinguished Flying Cross, Department of DefenseSuperior Service and Meritorious Service Medals, Navy Commendation Medal, NASAExceptional Service Medal, 3 NASA Space Flight Medals, and various other serviceawards. EXPERIENCE: Jett was designated a Naval Aviatorin March 1983, and reported to Fighter Squadron 101 at Naval Air StationOceana, Virginia Beach, Virginia, for initial F-14 Tomcat training. Uponcompletion of this training, he was assigned to Fighter Squadron 74 and madeoverseas deployments to the Mediterranean Sea and Indian Ocean aboard the USSSaratoga (CV-60). While assigned to Fighter Squadron 74, he wasdesignated as an airwing qualified landing signal officer (LSO) and alsoattended the Navy Fighter Weapons School (Topgun). Jett was selected for theNaval Postgraduate School - Test Pilot School Cooperative Education Program andcompleted 15 months of graduate work at Monterey, California, before reportingto the U.S. Naval Test Pilot School in June 1988. After graduation in June 1989, he worked as a projecttest pilot at the Carrier Stability Department of the Strike Aircraft TestDirectorate, Naval Air Test Center, flying the F-14A/B/D, T-45A, and A-7E. Jettreturned to the operational Navy in September 1991 and was again assigned toFighter Squadron 74, flying the F-14B aboard the USS Saratoga (CV-60). He has logged over 4,800 flight hours in more than 30different aircraft and has over 450 carrier landings. NASA EXPERIENCE: Selected by NASA in March 1992, Jett reported to theJohnson Space Center in August 1992. After two years of various technical assignments inthe Astronaut Office, Jett was assigned to his first mission as the pilot ofSTS-72. A year later he again served as pilot on STS-81. From June 1997 to February 1998, he served as NASADirector of Operations at the Yuri Gagarin Cosmonaut Training Center, StarCity, Russia. 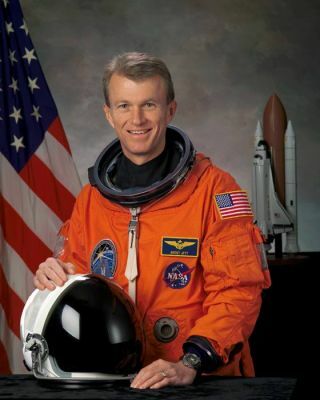 Two years later he flew as the Commander on STS-97.A veteran of three space missions, he has traveled over 12.1 million miles, andlogged a total of 699 hours, 15 minutes and 57 seconds in space. Jett iscurrently assigned as the Commander of STS-115. SPACE FLIGHT EXPERIENCE: STS-72 Endeavour (January 11-20,1996) was a 9-day flight during which the crew retrieved the Space Flyer Unit(launched from Japan 10-months earlier), deployed and retrieved the OAST-Flyer,and conducted two spacewalks to demonstrate and evaluate techniques to be usedin the assembly of the InternationalSpace Station. STS-81Atlantis (January 12-22, 1997) was the fifth in a series of joint missionsbetween the U.S. Space Shuttleand the Russian SpaceStation Mir and the second one involving an exchange of U.S. astronauts. Infive days of docked operations more than three tons of food, water, experimentequipment and samples were moved back and forth between the two spacecraft. STS-97Endeavour (November 30 to December 2, 2000) was the fifth American missionto build and enhance the capabilities of the International SpaceStation. STS-97 delivered the first set of U.S.-providedsolar arrays and batteries as well as radiators to provide cooling. Threespacewalks were conducted to complete assembly operations while the arrayswere attached and unfurled. A communications system for voice and telemetry wasalso installed.